In 1983, 8-bit microcomputing was hitting full stride. The market had split between colourful and noisy joystick-enabled TV appendages for home (as epitomised by the Commodore 64) and serious, no-nonsense, expensive mono-screen machines for business. Recognising these two evolving markets Tandy had machines for both namely the Colour Computer to grace the family living room and the business-oriented TRS-80 Model III, a direct descendant of the venerable Model 1. The Model III, released in 1980, was a fine computer but three years was a long time in computing back in the early 1980s. By 1983 the technology was getting long in the tooth. Businesses perusing spreadsheets and thumping out documents really wanted more screen real estate than the 64 characters x 16 lines the Model III could offer. 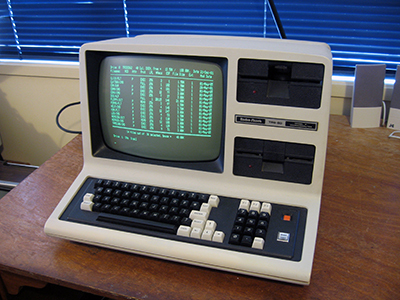 Furthermore, from the late 1970s and during the first few years of the 1980s, CP/M had become the standard DOS for 8-bit business machines. Everyone seemed to want it and the applications it brought (like WordStar). Tandy's response to these perceived market forces was the Model 4. Like the Model III, the Model 4 was all-in-one Z80-driven "serious" machine of quality. However, unlike the Model III, it sported 80 columns x 24 lines when used with a Model 4 DOS (like TRSDOS 6), could run CP/M and could be expanded from 64k to a whopping 128k of RAM! What's more it was completely backward compatible with the Model III. The technology was more integrated, more reliable and housed in an attractive off-white case rather than the battleship-grey of previous TRS-80 models. A clear winner surely! Actually, no. In 1983 the REAL competition for the business market was not CP/M machines, but the increasingly popular 16-bit 8088 PC-DOS IBM PC/XT and their soon-to-be-everywhere MS-DOS clones. The writing was already on the wall for the business 8-bit computer, and CP/M also. Tandy soon grasped this, and in late 1983 produced their own PC clone, the Model 2000. From that time on the Model 4 was a sleeper, never getting much attention from the market OR even from Tandy itself! It's taken me a long time to find one of these machines. They are rare in New Zealand. To me, they represent the end of a classic line of microcomputers and DOSes which started with the TRS-80 Model 1 in 1977. The TRS-80 I/III/4 family had a huge user base, with some fine operating systems and a deep and significant "culture" not unlike that which grew around the Apple II line of micros. Also, I just LOVE the look and feel of an "all in one" microcomputer. No messy cables to clutter up the desk! This 64k unit arrived from the U.S. fully-working and in fine shape! It's one of the early versions of the Model 4 (the non-gate-array version), but it's had a keyboard transplant and hence LOOKS like the newer (gate-array) model. Even more so in that I've now replaced the black and white screen seen above with a green screen. I've also stocked it up with disk to play with, pimped it with a FreHD hard disk emulator and acquired several manuals. One of my prize machines!